Sira Beach House exudes space, with nine thatched pavilions scattered among six acres of beachfront coconut groves. Through the villa’s private entrance gate is a large parking area, beyond which lie the living and dining pavilions, the chill-out room and the garden pavilion bedrooms. 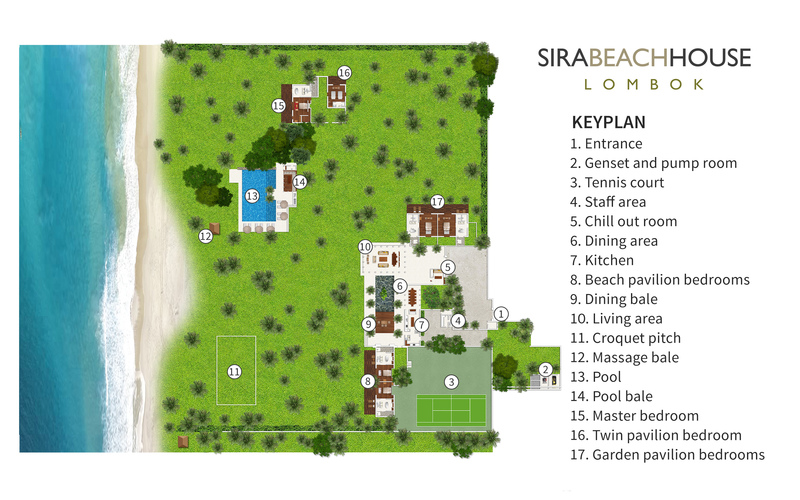 To the left of the entrance is the tennis court, in front of which are the beach pavilion bedrooms. Paths through the coconut grove lead to the master bedroom suite and accompanying twin bedroom suite and, almost at the sea’s edge, is the 18-metre pool with its deck, relaxation balé and shower room. All six charming bedrooms at Sira Beach House are designed in traditional Sasak style, and feature river-rock exterior walls, sliding bamboo screens, timber floors and high, thatched ceilings. All rooms are equipped with ceiling fans, air conditioning, mosquito nets, safety deposit boxes and hairdryers. Timber decks, furnished with teak planter chairs, look out over the palm groves and beach. Set almost on the sands of Sira Beach, the villa’s master bedroom has beautiful views across the Lombok Straits. These views can be enjoyed right from the king-size four-poster bed or from the terrace. The master suite has a small library area to one side, which can be set up with a child’s cot or single bed. To the other side of the room is a walk-in dressing room and a large ensuite bathroom with a freestanding stone tub, twin basins and a romantic outdoor shower. Next to the master suite, creating an ideal family enclave, is a twin bedroom furnished with two large four-poster beds fashioned from bamboo. Screens slide back on two sides of this room to reveal the garden views and a private deck. The ensuite bathroom features a walk-in closet and has both outdoor and indoor areas. These two bedrooms are situated close to the living pavilion overlooking the coconut grove to the side of the villa. Accessed via a private courtyard garden, both rooms feature sitting areas furnished with sofas that can be converted to single beds. These bright king-bedded rooms are adorned with vibrant textiles and carved antique chests. The ensuite bathrooms are fitted with freestanding stone tubs and outdoor showers. Screens at the front of the two beach pavilion bedrooms open onto a wide timber deck with fabulous views through the coconut palms to the beach. King-size bamboo beds form the rooms’ centrepieces and elegant rattan daybeds encourage time with a good book, cooled by the sea breeze. Antique kimonos and Indonesian textiles decorate the walls. In the bathrooms are freestanding stone tubs and built in dressing tables, as well as indoor/outdoor showers that open to a private garden area. The open-sided, thatch-roofed pavilions at Sira Beach House offer a delightful indoor—outdoor living experience that sets the scene for a blissful beachside holiday. The elegant furnishings in the sitting room are of rattan, wood and locally crafted textiles that perfectly complement their natural surroundings. Hanging from the vaulted ceiling are magnificent custom-made pendant lights that give a nod to one of Lombok’s most famous crafts – basketware. Discreet lighting hidden at the base of the sloped ceiling creates a magical effect as night falls. Glass lanterns and ancient tribal artefacts inject atmosphere and a sense of place. In a stand-alone pavilion close to the villa entrance is the ‘chill-out’ media room complete with comfy seating, satellite TV, DVD player and projector screen. This room can be opened to the tropical sea breeze for daytime relaxation or cooled down with air-conditioning for a fun movie night. Floating in the middle of the lily pond is the rustic thatched dining balé. With its Moroccan-style low-level seating this makes a cosy spot for kids and adult alike. The impressive dining pavilion matches the sitting room in grandeur, and is furnished with a massive wooden table for 14 diners. A bright yellow wall of tribal masks add to the atmosphere in this grand dining hall where the villa chef presents his delicious fare. Next to the 18-metre swimming pool, which is flanked by a broad timber deck furnished with sun loungers beneath shade-giving parasols, is the delightful pool balé. With the beach just a stone’s throw away, and built-in sofas to sink into while you enjoy a board game, or perhaps a sunset cocktail, this is a lovely peaceful spot. Adjoining the balé is a shower room and loo, so you really can relax here all day without having to move far at all.